BOSTON, MA -- As the NCAA college hockey season moved into November, there was barely a full month worth of games yet. In fact, many of the Ivy League teams played their first games the weekend just before Halloween. Even still, the impact of United States Premier Hockey League players across the NCAA realm has been fully realized in just that short amount of time. Among those most impressed were the players still working towards their college hockey dreams, such as Riley Prattson of the Boston Junior Bruins in the National Collegiate Development Conference. From the first season of the NCDC alone, numerous players are skating at the NCAA hockey level this year. Looking at the alumni from USPHL Premier member teams of 2016-17 and the NCDC member teams of 2017-18, there are currently more than 400 former players out of the USPHL’s top division on rosters at the NCAA level. “Every time you step on the ice is an opportunity to prove yourself,” added Prattson, currently one of the top 20 scorers in the NCDC. Even at the top level of NCAA, former USPHL players are having a great impact. There were five teams led at the end of October by USPHL alumni. These are Dartmouth College (Drew O’Connor/Junior Bruins), the U.S. Military Academy (Dalton MacAfee/South Shore Kings), Mercyhurst University (Joey Duszak/P.A.L. Jr. Islanders), Northeastern University (John Picking/Junior Bruins) and the University of Maine (Jacob Schmidt-Svejstrup/Junior Bruins). Former South Shore King Craig Pantano has established himself as a No. 1 goalie with Merrimack College, and was already named a Hockey East Defensive Player Of The Week. Ex-Junior Bruin Mike Robinson is the No. 1 goalie at the University of New Hampshire. Former Islanders Hockey Club standout Bobo Carpenter is the Captain of Boston University. Fourteen players from the NCDC last year posted at least one point in the first weekend of NCAA Division 3 play at the end of October, over which only a portion of teams at that collegiate level played games. The top level of the USPHL has also produced several players who have gone on to success beyond the college level. This includes such players as the Buffalo Sabres captain Jack Eichel (Junior Bruins), the Minnesota Wild’s Charlie Coyle (South Shore Kings), and a relative newcomer to the NHL, the St. Louis Blues’ Zach Sanford, a former Islanders Hockey Club standout who had six points in his first five NHL games this season. Simply put, the NCDC has established itself as a stepping-stone for impact players at the NCAA Division 1 and pro hockey levels. Today, the USPHL Premier name is attached to the top Tier-3 level of the United States Premier Hockey League. This is one of the largest platforms for player development anywhere in the world, with 51 teams ranging over a footprint as far east as Maine, as far west as Minnesota and as far south as Florida. The USPHL Premier in 2017-18 featured the most NCAA Division 3 commitments of any U.S. junior league, with more than 160 moving on to that level. As aforementioned, the impact of these players at the NCAA Division 3 level is still mostly to be felt in future weeks and months, as that season has just begun. Even with that in mind, 19 players who skated in the USPHL Premier in 2017-18 had points for their teams in either one or two games played. The Premier Division also offers players opportunities to skate in the future for teams in the National Association of Intercollegiate Athletics (NAIA) and American College Hockey Association (ACHA) club levels. Pete Flynn, head coach of the Detroit Fighting Irish, said that his job is to develop players for whichever level at which they can both make an impact on their college team and get a great education. In the South, the teams have also been able to advance players to the NCAA and other college levels from such non-traditional hockey locales as Fort Myers, Fla. (Florida Eels), Hampton Roads, Va. (Hampton Roads Whalers) and Charlotte, N.C. (Charlotte Rush). Eels owner/general manager Frank Scarpaci explained how he has created a program that focuses not just on the hockey development - but with over 800 hours of training each year, there’s plenty of that - but everything from test prep to language lessons for its foreign-born players. Wisconsin Rapids Riverkings head coach Marty Quarters was thrilled to see two of his former players clash against each other in their NCAA Division 3 openers. Lebanon Valley College’s Kevin Van Bokkelen played from 2015-17, and Jake Gaydos (2017-18 Riverkings) played for SUNY-Cortland. “It’s great to see these Riverkings succeed in collegiate hockey, as they continue to build hockey up and down the river, and all the way to the East Coast,” Quarters added. 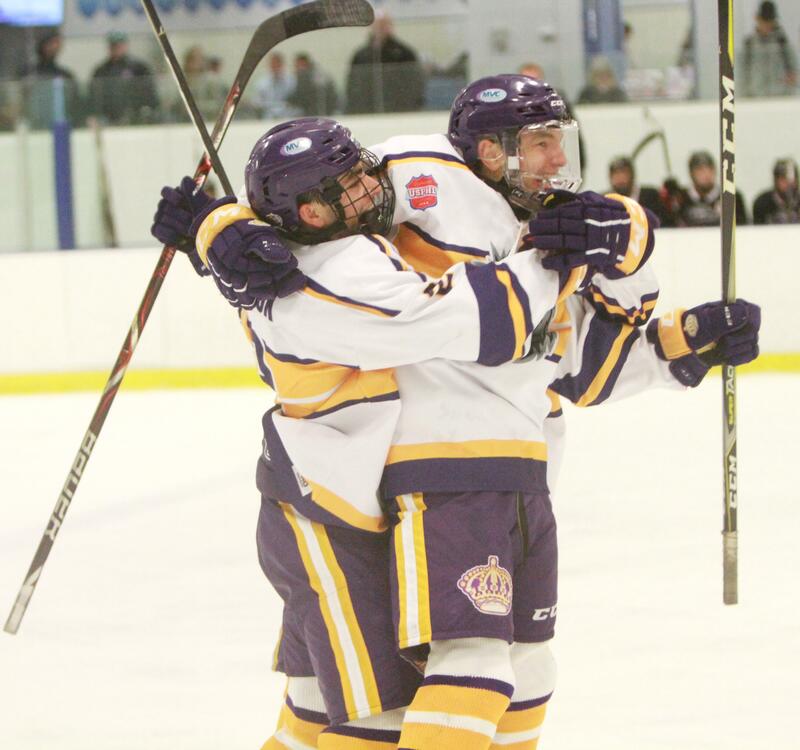 The USPHL Elite of the last two seasons has been the moniker for the USPHL’s second level of Tier-3 hockey, but that league itself has seen college advancement. More than 20 players advanced directly into NCAA or ACHA college hockey this season from the USPHL Elite, typically a much younger league than the Premier. The vast majority of USPHL Elite players from last season (roughly 150) advanced to the USPHL Premier for this season, moving up within the league’s multi-tiered structure. While the USPHL Premier’s chief destination is college hockey, some players currently in the NCDC have enjoyed making the transition from the USPHL Premier, such as Tyler Glennon. He was the leading scorer of last year’s New Jersey Rockets Premier team, posting 53 points. He also had a three-game call-up with the Rockets’ NCDC team in 2017-18 and is now a full-time member of that squad. Once again, Glennon is leading a Rockets team, as he was tied after 16 games for the NCDC team lead in scoring with 17 points. Each NCDC team has Affiliate members in the USPHL Premier, which can send players up for practices with the NCDC team and potentially games as well. “We sent a few of our players up to the NCDC’s Islanders Hockey Club last year, and we’re hoping to set dates to do that again,” said Flynn, of the Detroit Fighting Irish. “My two players I sent there last year are both playing Tier-2 junior hockey this year, so it is a good program." The United States Premier Hockey League expanded its full-season 16U Division this year to 31 teams from 20 last year, and rebranded its former 16U Futures Division as the full-season 15U Division. The league also features a slightly expanded 18U Division, up to 20 teams from 18 last season. The full-season Midget divisions are becoming an increasingly more direct path to the NCDC. From last year’s 18U division, more than 50 players advanced directly to this year’s NCDC, and many teams in that division are developing their future players in-house, utilizing their 18U and 16U teams. For instance, there are eight former 18U and six former 16U P.A.L. Jr. Islanders players currently skating for the Jr. Islanders’ 2018-19 NCDC squad. James Zegel came up to the NCDC’s South Shore Kings from the 18U Division and was immediately the NCDC’s tallest player at 6-feet-7-inches. He has skated in the USPHL at the 16U, 18U, Elite and Premier levels before skating in the NCDC, with the majority of those games coming in the Midget Divisions. Brett Schneider, one of the New Jersey Hitmen 18U team’s top forwards, said he is excited to play within the USPHL and advance through its different tiers, especially if he can do so while staying with the Hitmen. 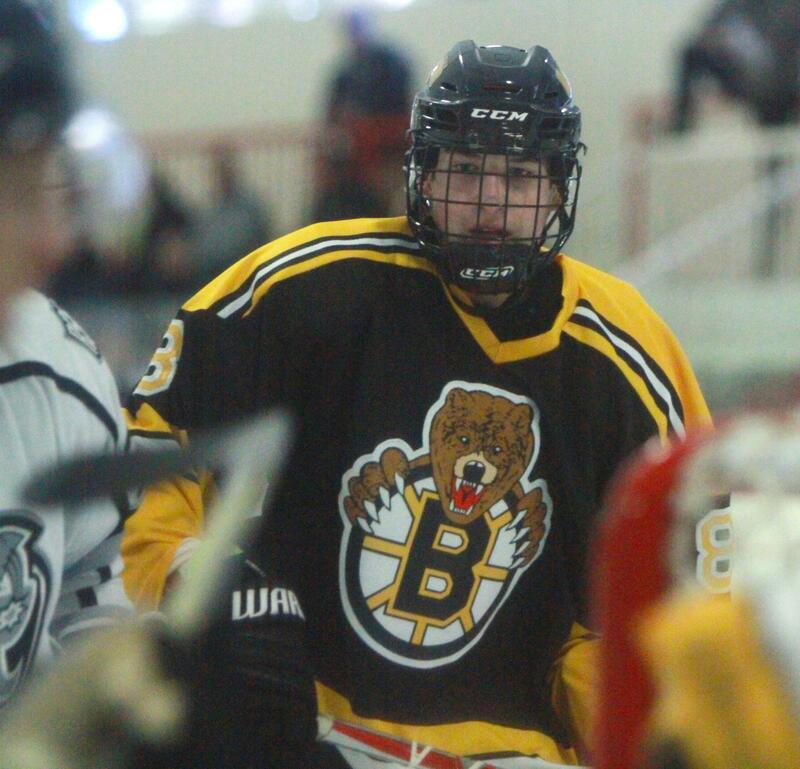 Cade DeStefani, of the Junior Bruins, is one of just 10 players from the 2017-18 USPHL 16U Division to make the bold jump directly into the NCDC this year. More than 60 players moved up from the former 16U Futures Division (now 15U) to the USPHL 16U Division of this year. The talent level that has played in the 16U Division is not lost on this year’s 15U players. Looking at 16U Division member teams of 2017-18, more than 40 players from those programs have gone on to NCAA Division 1 careers. Tristan Daneau, of the P.A.L. Jr. Islanders 15U team, wants to go to the Islanders’ 16U program, which currently counts among its alumni seven current NCDC players and six more in the Tier-1 junior realm. This is the first season for the USPHL’s split-season EHF Selects Midget Division, but it is already turning heads not just in its New England base of operations, but nationally. MYHockeyrankings ranked the Boston Jr. Eagles’ 18U team as its No. 1 Tier-1 team in the U.S. at that age level for four of the first five weeks of this season. In addition, the EHF Selects featured five Top 20 18U teams in the MHR rankings of Oct. 31. There have also been two Top 20 16U Tier-1 and two Top 20 15U Tier-1 teams in the rankings out of the EHF Selects. With this being the first year of the EHF Selects, advancement remains to be seen, but this could be yet another scouting ground for NCDC teams to develop players within the USPHL progression path, and onwards to the NCAA. Matt Collins, head coach of the Cape Cod Whalers’ 15U team, ranked 17th nationally on Oct. 31, said he’s excited for the future of the EHF Selects and USPHL, in looking at the players on his team this year. Whether you’re one of the top 14-year-old players looking to take the next big step, or a 20-year-old close to making a college decision, the United States Premier Hockey League has a division for you - and a ladder to climb.